It’s no secret that social media use is increasing among people of all generations. The image below reveals 2012’s growth trends among non-profit organizations. The enormous influence of social media creates a fertile ground for non-profit organizations who want to increase their exposure. Digital Marketing Sapiens gives non-profit organizations the tools and expertise they need to make sense of the ever-expanding realm of social media. Build a base for your organization by interacting with others online. Market your organization and its goals. Conduct call to action campaigns by recruiting volunteers, advertising events, and highlighting petitions. Create additional fundraising opportunities and connect with valuable supporters. Social media works for non-profit organizations. Just ask A Walk for a Cure, a non-profit dedicated to ending Scleroderma, an auto-immune disease. The group faced a dilemma when it came to fundraising because many Americans don’t even know what Scleroderma is. The organization conducted a massive social media campaign by creating a video sharing platform and then posting links to their on Facebook and Twitter. Users did the rest, and A Walk for a Cure was able to raise $15,000 dollars for their virtual campaign. The word-of-mouth communication that drives social media helps people become aware of non-profit organizations and their campaigns. We want to help your organization succeed. Our expert team starts by helping you and your organization identify your long and short term goals. Then we develop a tailored strategy for how you can turn those goals into reality. 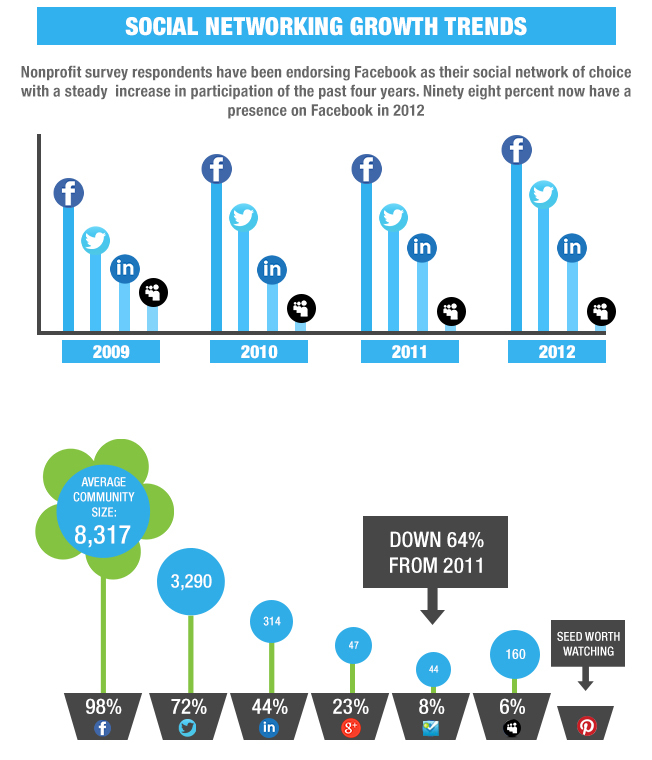 Source: Nonprofit Technology Network, “2012 Nonprofit Social Networking Benchmark Report”, May 4, 2012.